This morning I had the fantastic opportunity of being interviewed by Fran Kelly on ABC Radio National’s Breakfast program. Fran asked me about how Sicilians traditionally celebrate Christmas and to suggest different menus featuring seafood and accompaniments that Australians could prepare as alternatives to the traditional turkey, chicken and ham, which are being replaced on our Christmas dinner plates. Who am I feeding will they like this dish? How many? How much time do I want to spend cooking/ Hot day or cooler? What can I prepare before hand? What fish looks good at the market? Which is my focus ‘wow factor’/emphasis? (is it to be (antipasto) entrée, pasta (first course) or (second course) main? 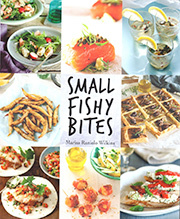 Or would I prefer to present a selection of small courses? 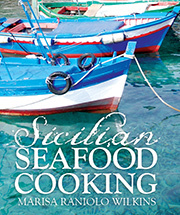 In Sicilian Seafood Cooking there are many recipes that in Sicily are intended for swordfish and tuna. Although I have retained the name of the recipe I have also selected fish that are sustainable as preferable choices to endangered species. Sicilians have simple starters – a plate of olives, some nuts and this is because they like to save their appetites for what is coming and therefore I have selected a light fish starter. They also enjoy eating pasta and this is why I have given several alternatives for the first course. For the first course there is also a rice alternative. By the time you get to the second course you may need a big rest, but I have provided two recipes. Vegetables have not been included in this menu but they are and as well as important in Sicilian cuisine and there are very many interesting recipes in Sicilian Seafood Cooking and of course beautiful photos, not only of the recipes but as Fran said, also of Sicily. The fish needs to be fresh and of excellent quality and sliced thinly. Keep it in the fridge while it is in the marinade. The recipes for marinating tuna suggest using a mixture of 7 parts vinegar to 3 parts lemon juice. I prefer to use just lemon juice or 9 parts lemon juice to 1 part vinegar. You may wish to experiment. This dish is usually served as an antipasto. The recipe is intended for bluefin tuna which is not sustainable. Any skinless fillet cut thinly can be marinated the same way. Marinate the fish in the lemon juice and vinegar, making sure that the fish is covered with the marinade. Add oregano and place in the fridge for 30 minutes. For the dressing, mix together the spring onions, celery, capers, parsley, olive oil and seasoning. When ready to serve, remove the fish from the marinade and pour the dressing on top. Clean the squid or cuttlefish carefully and extract the ink sac. Cut into 1cm rings and set aside. The tentacles can also be used. For the sauce, sauté the onion and garlic in the oil, add the tomatoes and tomato paste, parsley, white wine and sale. Bring to the boil and reduce until the salsa is thick. Add the ink and chilli flakes to the sauce and mix well. Add the squid rings and cook over a medium-high heat until the squid is cooked to your liking. Place it in the colander lined with cheesecloth and refrigerate for at least 2 hours or overnight. Mix the ricotta with a little salt and any of the extra flavourings. The most authentic and quickest way to cut the ravioli is by hand. There is no prescribed size- can be round or square or half-moon shaped. To make individual ravioli, cut pasta into circles or squares. Place heaped teaspoons of stuffing in the centre of each, continuing until all the stuffing is used. For half-moon shapes fold the pasta over the filling. For others lay another circle or square over the top then moisten edges with a little water and press together carefully to seal properly. Set the finished ravioli on a lightly floured cloth. They can rest in a cool place for up to two hours. Cook the ravioli as you would any pasta. Lower them into water a few at a time and scoop each out when it floats to the surface. Dress them carefully with the black ink sauce so as not to break them. Serve as is or with a scoop of ricotta or some grate pecorino. Clean the cockles and mussels (see pages 84 and 87). Steam in a covered frying pan coated with a little oil. Once opened, shell them, but reserve some mussels in their shells. Cut up the flesh and save the juice. While you are preparing the seafood, cook the rice (add the rice to plenty of rapidly boiling, salted water). Drain and place in serving bowl. In a wide pan, sauté the garlic and parsley in extra virgin olive oil. Add prawns, squid (and any other seafood) and season. Stir for a few minutes, then add the clam juice. Toss for a few minutes without reducing the liquid. Add mussels and cockles (shelled and unshelled) and heat through. Mix the seafood with the rice. Arrange some mussels in their shells on top to look like angels with open wings. Serve with grated cheese. The terms lobster and crayfish are often used interchangeably, but the marine species are lobsters and the freshwater species are crayfish. There are many types of lobsters known by a variety of local names. Lobsters (aragoste) are popular around Trapani, although they are expensive. When making pasta with aragosta, I often buy spiders (the legs) – they can be quite meaty and very suitable for a pasta dish that requires cooked lobster. When buying lobster, select a heavy specimen with a good strong shell. They molt several times in their life cycle and, if they are pale with a thin shell, they are not likely to have much flesh. As for size, anything less than 1.5 kg (3lb 5oz) is not worth buying – a lobster under that size doesn’t have enough meat, especially from the spiders. There is no comparison between the taste of a freshly cooked lobster and one purchased already cooked.Although this recipe is especially suited for lobsters, other crustaceans can be used. This dish requires cooked lobster and it is added last. The other ingredient sare raw and pounded in a mortar and pestle (or pulsed in a food processor). The raw ingredients can also be finely chopped and mixed together. Use fresh ripe tomatoes. This pasta dish is fantastic for the hot weather and it could be part of a celebratory lunch (such as Christmas in the Southern Hemisphere). Remove the flesh from the lobster, tear or cut into small portions and place it in a bowl with the juice of 1 lemon and some of the oil. (you may not need all of the lemon juice). and lobster and mix it gently. I like to add more grated lemon zest on top. off tentacles and save them for another time. Mix the remaining ingredients except the oil together; check the seasoning. Stuff the squid and secure each end with a toothpick. Sauté each squid in olive oil – when the juice escapes it caramelises – turning once only during cooking. Alternatively, cover with foil and bake in a 200°C (400°F) oven for about 10 minutes. The squid will produce its own juice. To caramelise, remove foil and bake the squid for an extra 10 minutes. Add chopped pistachio rather than almonds. on. The fish is cooked whole and carved like meat at the table. fish for about an hour, turning frequently. Place the fish in an ovenproof dish, spoon half of the marinade over it and bake for 10 minutes in a 200°C (400°F) oven. Arrange the sliced potatoes around the fish. Sprinkle the potatoes and the fish with more marinade, the anchovies, lemon juice and grated zest. Bake for another 20–35 minutes, depending on the type of fish. Serve hot. Place rosemary and bay leaves underneath the fish in the baking pan.